The vibrant, modern holiday resort of Puerto Rico, on the island of Gran Canaria, revels in excellent weather year-round, being situated on the island's southern tip just across the ocean from the Sahara. Scenic Puerto Rico is encircled by hills, its white-washed holiday accommodation clinging to steep cliff sides above two golden beaches. The picturesque resort includes three large commercial centres overflowing with shops, bars and restaurants, and is flanked by a marina packed with luxury yachts where it is possible to indulge in almost every kind of water sport imaginable. Puerto Rico is primarily a family resort, with sunny corners for seekers of peace and tranquillity, and lively venues for family entertainment. Puerto Rico also boasts a decent nightlife, although it is not a famous party resort. Puerto Rico boasts three large shopping and entertainment malls, the largest being the Centro Civico, where visitors can buy literally anything. There is everything from banks and boutiques to florists and fishmongers, and dozens of duty-free stores selling electrical goods, photographic equipment and perfume at great prices. 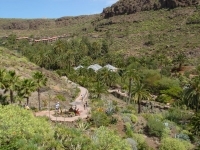 The other two centres are Agua La Perra and Europa, and both have good selections of restaurants, souvenir stores and beachwear shops, and at least one supermarket. Opening hours for shops and supermarkets in the centres are about 9.30am to 10pm in the peak summer months. The largest market on the island is at Arguineguin, only 10 minutes away by taxi, and is open every Tuesday. This is a good place to test your bargaining power; hagglers should start negotiating at about half the asking price. Like most holiday resorts on the Canary Islands, Puerto Rico has various top-rated eateries, including Caballito de Mar, Le Petit Lyonnais, Ma Bakers and El Brasero. The restaurants and fast food outlets cater for a wide range of tastes. Here you can dine on anything from fish and chips to haute cuisine. Most of the restaurants are in the Centro Comercial and those who like to dine overlooking the beach will find some good restaurants on the west side of the bay. Puerto Rico has a few discos and many good bars, but cannot compare to the Gran Canarian party resorts of Playa del Ingles and Las Palmas. Nevertheless, there is plenty of fun to be found after dark in the Puerto Rico and Europa centres, and many of the hotels offer entertainment. Puerto Rico is the perfect resort for a sporting holiday, offering numerous active diversions, not least of which are a wide range of water sports available at the marinas at each end of the bay, including windsurfing, jet skiing and banana rides. Out of the water visitors can enjoy tennis and squash courts and a gym in the Centro Comercial. Youngsters particularly enjoy the amusement arcades in the three shopping centres, and the mini-golf is popular. A variety of excursions are available to various attractions around the island, including a water park, while for the adrenaline junkies there is paragliding, skydiving and scuba diving. Puerto Rico is built on steep cliff sides and most apartment blocks are reached via long stairways. Those with difficulty walking should ensure they find accommodation on the level. The holiday resort is full of touts and 'promotions staff' from various restaurants and shops vying for business. They can be overly insistent and should be dealt with firmly but politely.